--Update: End of the Road 2011 is now sold out. 28/06/11. If you wanted to go I hope you managed to get a ticket. "Dear All, Yes folks, you heard it correctly - Adult tickets to the festival are now running low! In fact, we've only got 300 tickets left and once they're gone - that's it! Sold out! So, if you would like to join us in September - don't delay! Go get your tickets now! 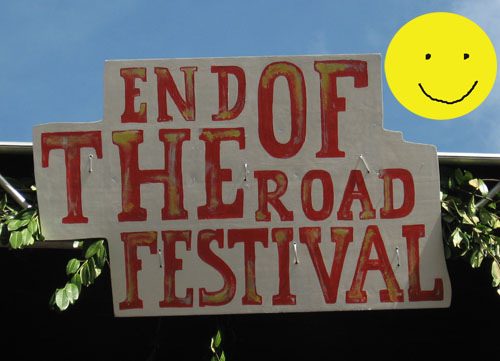 Lots of happy wishes, The End of the Road Festival Team"
If you're thinking about going I'd say you'd do well to pick up a ticket quick smart, after Glastonbury people might be looking for more festivals or they might never want to go to one again! Anyway, snooze and lose as they say.